It’s not unfair to say No. 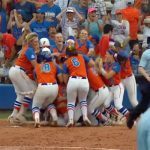 2 Florida Gators softball was lucky to come away with a win Thursday in Game 1 of its 2018 Gainesville Super Regional against the No. 15 Texas A&M Aggies. To that end, the visitors ensured luck would not strike twice. Texas A&M (44-17) picked up the program’s first win at Pressly Softball Stadium on Friday (1-8), using two timely home runs to earn a 5-4 victory over Florida (55-8), which trailed most of the game but took the lead over the middle frames. The Aggies tagged senior right-handed pitcher Aleshia Ocasio with a solo homer in the first inning and took advantage of two defensive miscues to plate another run in the second, but the Gators were able to answer quickly as senior catcher Janell Wheaton (2/4, 2 RBI) smacked a two-run, two-out single to tie the game in the third. Senior third baseman Nicole DeWitt (2/4, 2 RBI, R) followed suit with a bases loaded two-run single in the fourth to put UF on top 4-2. It did not take long for Texas A&M to respond as Ocasio gave up her second dinger of the game in the fifth, this one a three-run blast with two outs that put the Aggies on top for good. Ocasio (6.0 IP, 9 H, 5 R [4 ER], 8 K) did not display the same sharpness she possessed in last week’s Gainesville Regional when she completed two no-hit affairs as she allowed leadoff hitters to go 4-for-6 against her on Friday. Head coach Tim Walton put junior RHP Kelly Barnhill up in the bullpen during the fourth but never made the switch, even after Ocasio’s fifth frame. 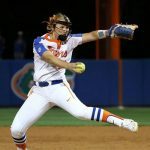 While the Gators did provide her with some help offensively, they once again managed to hit poorly with runners in scoring position (2-for-10) and stranded 10 on base over seven innings. That puts Florida at 4-for-29 with runners in scoring position thus far this week. Game 3 of the Gainesville Super Regional will begin at 5 p.m. ET on Saturday and air live nationally on ESPN. 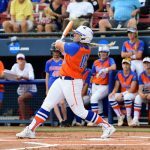 Florida is 7-0 all-time in Super Regional play when winning Game 1, and home teams have won 60 percent of Game 3s since the format debuted in 2005.